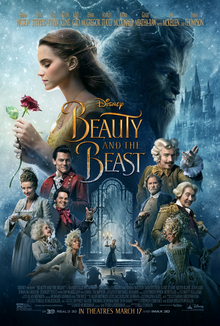 For the most part, I thought ‘Beauty and the Beast’ was a really enjoyable movie, following the same path as the 1991 film whilst expanding some elements and adding in a few nice diversions to avoid it feeling like a play by play. It doesn’t need to be as long and there are elements where you can feel Bill Condon is indulging a little too much in the wonderful technology at his disposal, namely in the concluding attack on the castle from the villagers, where bigger is certainly not better as an array of effects and CGI are thrown at the screen. It’s in the little moments when Condon’s version shines and when it leans into the heart that made the original so wonderful it really worked for me, and I thought it expanded on the relationship between Belle and the Beast effectively. The musical numbers are well staged and well sung, and the casting is basically perfect for all of the roles. I thought Emma Watson was good and she has a lovely singing voice, and the various characters in the castle are great (even accepting a couple of minor quibbles with Ewan McGregor’s French accent and Emma Thompson’s cockney singing voice!). The show is stolen by Luke Evans as Gaston though, perfectly capturing the boorishness and misplaced charm of the arrogant oaf, and dare I say it, Josh Gad is great as his sidekick Le Fou. I liked ‘Beauty and the Beast’ a lot more than I expected too, and whilst I can’t see myself returning to this version ahead of the animation, it was an enjoyable and well made cinematic experience that managed to recapture the magic of the original tale, and I’d recommend it.